Whether going out on hot date or just running to the grocery store, I just need a handful of items. My driver's license, a few dollars, a credit card and my phone are really the only things that I need. Forget the big purse. Still, I don't want to stuff everything in my pockets (if I even have pockets). The Olympian Tech iPhone 6 Wallet Case is my new solution. 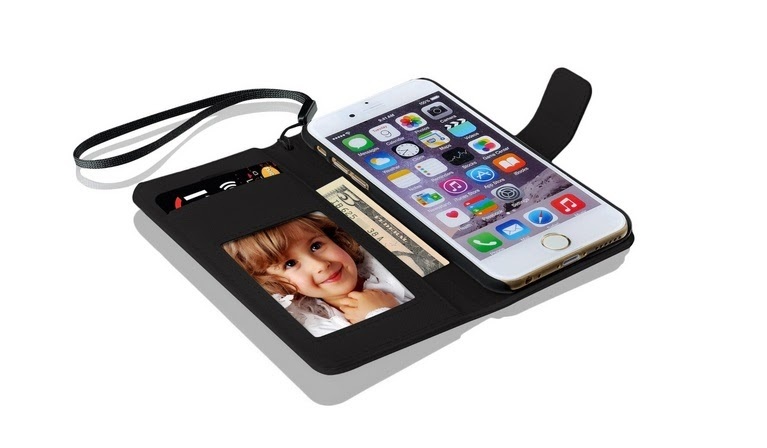 The Olympian Tech iPhone 6 wallet case combines the minimum must haves in a convenient carrying case. This premium leather case offers a secure way to hold an iPhone 6 with a convenient way to carry your driver's license, credit card or cash. Fitting easily in the palm of your hand, this wallet case is ready for the run to the grocery store or a night out on the town. This wallet case is best used with minimum items. The wallet slots are tight, which hold the cards securely. Still, the benefit of the slim case is to carry the bare minimum items. The case closes with a magnetic closure. It does stay closed well. Also, it lays flat when open which is convenient for using the phone. The case still allows you take pictures, talk and text without taking the phone out of the protective case. The only downside is that there is no protective cover on the face of the phone. Still any plastic covering over the face can help protect the phone from scratches or other problems. The Olympian Tech iPhone Wallet case can be purchased on Amazon.com. It comes in black or red. The retail price is $29.97. Simplify what you carry; the Olympian Tech iPhone Wallet Case is all you need. Disclosure: The reviewer received this item to share her opinions. The thoughts expressed in this post are her own.